War walkers are awesome but they sport paper thin armor. I've found the best way to protect them is by giving them long range weaponry and keeping them as far from the enemy as possible. Like all walkers, they absolutely excel at city-fight games as they can enter terrain with no risk and benefit from cover saves. The best way to equip them is by giving them both a scatter laser and star cannon. You need to give them 36" range and a high rate of fire to compensate for their low BS. Save the tank-hunting for firedragons or wave serpents with twin-linked weapons. Deploy them on a far flank to protect them from enemy fire. Target units of infantry. The key to their survival is keeping them out of range of rapid-fire weapons and other small-arms fire. 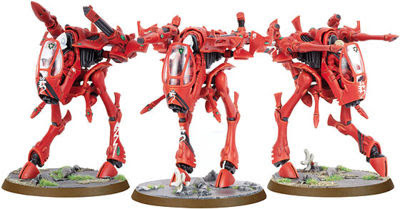 Opponents normally use their anti-tank weapons for all those eldar skimmers, so War Walkers will be targeted mostly by what he has left so just keep them out of range of what he has left! I too intend to start off some warwalkers soon have do have scatter laser and starcannon in mind as well. Although your points in the missle launcher against tau is indeed a very good point. Perhaps a good mix of them all!